Next-Generation Audio Conversion with Eight Unison™ Mic Preamps and Classic Analog Sound. 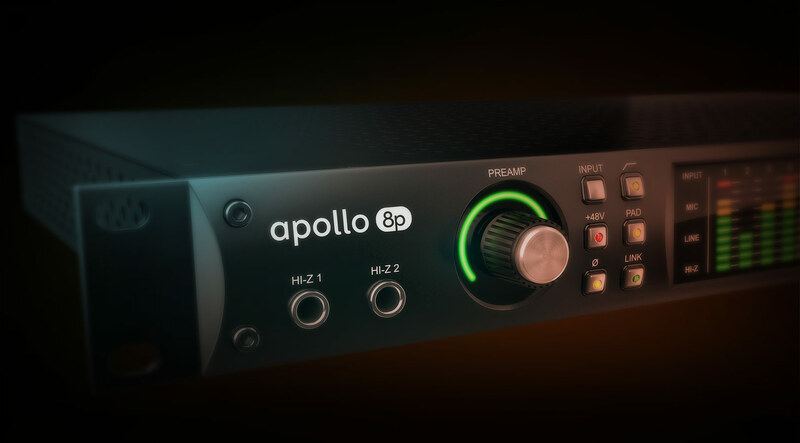 Apollo 8p is the premium eight-preamp version of the world’s most acclaimed professional recording interface for Mac and Windows — giving project and commercial studios superior A/D and D/A conversion with the tone, feel, and realtime workflow of classic analog recording. Built upon UA’s 60-year heritage of audio craftsmanship, Apollo 8p distinguishes itself with eight Unison-enabled mic preamps, onboard UAD-2 QUAD Core processing, and an included bundle of award-winning UAD plug-ins — which you can track through with near-zero latency, shaping sounds like a classic analog studio — without taxing your host Mac or PC. Apollo 8p comes equipped with eight Unison-enabled mic preamps, letting you track larger projects through exacting mic preamp emulations from Neve, API, Manley, and Universal Audio. An Apollo exclusive, Unison technology nails the tone of these sought-after tube and solid state mic pres — including their input impedance, gain stage “sweet spots,” and the component-level circuit behaviors of the original hardware. The secret to Unison is its hardware-software integration between Apollo’s mic preamps and its onboard UAD-2 QUAD or DUO Core DSP Acceleration. Simply place a Unison preamp plug-in on your mic input in Apollo Console software, and it physically reconfigures the Apollo interface's impedance — so you can tap into the classic sounds of the world’s most recorded mic preamps. Right out of the box, Apollo 8p provides a suite of incredible analog emulation plug-ins including the world’s only authentic Teletronix LA-2A, 1176LN, and Fairchild compressors, the legendary Pultec EQs, and the Unison-enabled UA 610-B Tube Preamp. Developed by UA’s world-renowned team of algorithm engineers, these Realtime Analog Classics plug-ins set the standard by which all other hardware emulation plug-ins are judged. Of course, the heart of any audio interface is the quality of its conversion. In designing the next-generation Apollo range, UA engineers started with an obsessive auditioning of the latest A/D and D/A converters, ultimately pairing the selected 24-bit/192kHz converters with all-new analog circuitry for the optimal signal path. Apollo 8p provides increased dynamic range and lower THD versus other interfaces — rivaling dedicated converters costing thousands more. Watch UA’s Lev Perrey explain the innovative thinking behind the next-generations Apollos. Apollo is the confirmed choice of hit-making professionals, used to record landmark albums by Kendrick Lamar (DAMN. ), Chris Stapleton (From A Room: Volume 1), Arcade Fire (Everything Now), Post Malone (Beerbongs & Bentleys), and many more. The Apollo range of interfaces has earned numerous industry awards from Sound on Sound, Future Music, and Electronic Musician — as well as the prestigious 2016 TEC Award for computer audio hardware. “My Apollos are my sound. Watch producer/engineer Fab Dupont (Jennifer Lopez, Mark Ronson) install a powerful studio system by combining multiple Apollo interfaces over Thunderbolt. Apollo 8p offers 16 x 20 simultaneous inputs/outputs, with two built-in Thunderbolt ports. Thanks to Apollo Expanded software, users of any Thunderbolt-equipped Apollo Twin, Apollo 8, Apollo 8p, and Apollo 16 audio interfaces can combine up to four Apollos and six total UAD-2 devices — adding I/O and DSP as your studio grows. Apollo 8p also provides seamless integration with previous generation Apollos over Thunderbolt. With Apollo 8p’s Console 2.0 application — a complete re-imagining of Apollo’s original Console software — you can take advantage of over 25 new user-requested features such as Channel Strip presets, Drag & Drop functionality, dynamically resizable windows, and more. New for Apollo 8p is Unison technology on the front panel instrument inputs, giving you dead-on, impedance-matched emulations of guitar and bass amps like the Fender '55 Tweed Deluxe, Marshall Plexi Super Lead 1959, and the Ampeg B-15N Bass Amplifier. With the Realtime Analog Classics Plus plug-in bundle, you not only get legendary compressors such as the Fairchild® 670 and EQs like the Pultec® EQP-1A, but also stunning guitar and bass amp emulations from Softube, and UA’s landmark 610-B Tube Preamp and EQ plug-in. Impart your tracks with the iconic warmth and character of the classic hardware used to track everyone from Duke Ellington to Coldplay. By emulating the entire signal path, including tube amplifiers, transformers, and circuit nonlinearities, the 610-B Tube Preamp and EQ plug-in injects organic detail and saturation to any signal — whether you’re re-amping or tracking through the 610-B via Universal Audio’s Unison™ technology. The undisputed alpha dog of rock and roll guitar amps, the Marshall “plexi” amplifier is as legendary as the music it helped create. From Jimi Hendrix to Jimmy Page, Duane Allman to Eric Clapton, the Plexi’s punishing melange of snarl, sustain, smoothness, and raunch defined the sound of rock. Developed by Softube, the Marshall Plexi Classic Amp plug-in gives you the sound of this iconic amp with a perfectly placed microphone from engineer Tony Platt who recorded AC/DC’s Back in Black and Highway to Hell. The world’s most coveted compressor, the classic Fairchild 670 tube limiter will give your tracks and mixes unmistakable tube warmth and character. Whether you’re looking for subtle compression on a lead vocal, or grittier textures that can work on guitars, bass, or a drum bus, the Fairchild 670 plug-in adds a classic “glow” to anything you run through it. With its gentle, program dependent optical compression and meticulously designed tube amplifier, the LA-2A is the go-to compressor for professional mixers around the world — especially for vocals. Incredibly easy-to-use Peak Reduction and Gain controls gives you the ideal optical compression sound for guitar, bass, drums, and more. Get classic, ultra-fast FET compression from the world’s most recognized compressor. The 1176 will impart punch, presence, and character as well as its signature distortion overtones on drums, vocals, guitars, and bass. The 1176LN has graced countless recordings, from Led Zeppelin, to the White Stripes and Michael Jackson. Mix with two of the most sought-after hardware EQs ever made — the MEQ-5 Midrange Equalizer and the EQP-1A Program Equalizer. Both of these tube-based icons deliver smooth and silky EQ curves with an abundance of warm analog character. Introduced in 1969, the Ampeg SVT bass amp is still the reigning king of high-powered tube bass tone. Developed by Brainworx, the Ampeg SVT-VR Classic Bass Amp plug-in perfectly captures the raw power and punch that has made this the go-to amp for rock, funk, and soul players. Track in real time using Unison™ preamp technology for the tone, touch, and feel of a real SVT bass amp, or transform bland DI tracks with the thunderous roar of a stone cold classic. Featuring the Precision Channel Strip, Precision Reflection Engine, and Precision Delay Modulation plug-ins, the Precision Mix Rack Collection offers four modern, high-fidelity plug-ins for recording and mixing. Powerful and intuitive, Precision Mix Rack Collection gives you an impressive tool set — perfect for beginners and seasoned professionals alike. Expertly dial-in your music’s low-end frequencies with the Precision Enhancer Hz plug-in. Able to yield exacting results with minimal adjustment, the Precision Enhancer Hz can add weight to kick drum samples, fatten up a synth bass, or simply make the low-end of your tracks more audible on smaller speakers. Modeled from a vintage early-’80s Pro Co Rat, Raw Distortion delivers all the gritty dynamic raunch of the legendary stompbox. And with Unison™ technology, you can plug in to Apollo Twin, 8, or 8p’s front-panel Hi-Z instrument jack and experience the same circuit interaction, gain range, and clip points for the true tone, feel, and response of the original hardware. RealVerb Pro is a flexible, natural sounding reverb based on UA’s own unique set of algorithms. Allowing you to design the room just as you hear it, the RealVerb Pro goes beyond simply big/small or dark/bright, giving your sources distortion-free, smoothing diffusion control and ultra-long reverb tail. *Apollo 8p includes the “Realtime Analog Classics Plus” UAD plug-in bundle. Other UAD plug-ins sold separately. Universal Audio have disabled the 2nd ADAT lightpipe port for 44.1khz and 48khz digital transfers. I attempted to transfer audio from my HD24 but the 8p does not see it. UA should clearly indicate this in their literature and not bury it on page 22 of their manual. Also hearing slight pops and crackles in the audio from my unit. At one point it had issues not passing audio and I had to reboot it just to get the audio to pass through. Going to return this item. I just started my first project with the Apollo 8P. My workflow speed has increased significantly with this interface and the associated plug ins that came with it. It took me a long time to save for it but it's felt well worth it. I'm only a couple of weeks in but the new-gear honeymoon might last awhile longer with this thing. I love it. I already owned a few of the emulation plugs and can a/b them with the UAD version. The SSl channel has much more depth, and the Comp is now usable. The box is great. : the sound of the pres, conversion (both ways), the hardware (switches, metering), the software (no driver issues). The only issue is the lack of routing, specifically ear cues. My previous box (an RME unit) allowed one to send any ins to any outs. I (ignorantly) assumed a new technology like the UAD would by default include such a feature. Discovering a 4- cue max was quite a shock, almost enough to return the unit. I track larger bands, and not being able to have dedicated mixes for each player is a big problem. I feel like i wasted my money on this unit. the routing is frustratingly basic and integrating this into my workflow has been difficult at best. standalone it is a decent unit and recording through the plugins is an obvious plus but the routing is bafflingly limited and trying to use additional adat outputs is not an easy task. my RME units with total mix are FAR superior and much easier use. I consider myself a fairly "informed consumer" and I tend to research ALL possibilities before making any choices. I already owned an Apollo 16 (Silverface) and have thoroughly enjoyed it. I added the 8P primarily for the Unison preamps (8 already great preamps that you can mix and match 1073's, API's, and UA 610's with more to come Im sure, cmon -no brainer!) AD/DA, and clocking. I also REALLY like the fact that you can use one simple thunderbolt cable and get DSP, IO, and clock all at once. What I didn't anticipate was the much better stereo field and definition. Small changes seemed more noticeable, reverb tails seem more detailed...all in all a GREAT box. 8 emulate-able pre-amps and quad core processing is pure bliss. I couldn't say enough good things about the Apollo 8 if I tried. It's like waking up every morning next to an exquisitely beautiful woman and questioning "how can this be real?" Thanks for that UA! Just tracked a few drum tracks with the Apollo 8P and UA Store Plug-Ins. Using AKG 112 on Kick, Miktek PM10 on Snare, Sennheiser 421 on Toms, Shure KSM 32 OHs, and SM 81 on Hats. Absolutely no outboard pre-amps or compressors. I love how the Apollo captures the character of each mic, not to mention the DSP technology on all 8-inputs. Can't wait for the 16P (hint, hint) version to hit the market! First of all, the Apollo 8p sounds incredible! Routing and integration into my existing rig were a breeze. HOWEVER… for $3K, the DSP is lacking BIG time! At 96kHz, I get a Unison plugin, and one… maybe two additional plugins on each channel before the processor is maxed. Now try adding Ocean Way or AKG verb to an aux and real trouble hits! I was looking to start recording/mixing everything at 192kHz, but at that rate, I barely get Unison plugins on each channel before the Apollo 8p processor overloads. It's like UA made the Apollos just to wet your appetite so you have to spend more money on their satellite DSP accelerators. After some time with this unit I have come to the conclusion that it is a little hyped. First I would like to say that it sounds really good. The plug-ins are a better emulation than waves. The GUI are nice looking but, picking settings is a little frustrating. Also, I experience pops and clicks, minor lag when ran at 92k with 256 sample buffer (I have a decent new macbook and I'm running Ableton Live) Honestly, my little NI Komplete Audio 6 ran smoother. The biggest disappointment for me is of course that you max out real fast using 8 mic pre's along with plug-ins. I had 4 mic's with Neve pre amps and comps on each channel and that was too much for tracking. If you got the money and it's no big deal then this unit is a cool buy. Apollo 8p = Weak DSP.... Buyer Beware!!!!! I’ve always wanted to have my own studio with all the fancy outboard gear, and fancy plug-ins, but they were way out of my budget. With the Apollo you get all the fancy outboard gear and classic analog plug-ins that make a studio a studio. I needed som more inputs, so where to go? Apollo 8p of course. This is just terrific in my point of view, i run only UAD plugins and softube. Got my 2nd Unit for studio expansion and for live rig. This one is taken out of studio and used for live. The uad plugs are so awesome and amazing how it elevates the live sound too by using la-2a's 1176's, pultecs , ssl etc ... mainly software issues I noticed only 3 things it could improve on and hopefully fixed in upcoming software updates! 3) there's no visual difference between owned plugs and not owned ones (when selecting) which makes it difficult for someone who doesn't know your owned plugins to select plugs on the fly. Can be a little frustrating. The power and diversity of the Apollo is absolutely amazing!! Also the various tutorials make it possible for any person to learn to use the software, regardless of experience level! I really dig it. The unison pres are great. The conversion is great. The software is easy to use and once I got used to it, I don’t find it bothersome to use. The plug ins we all know are great. Great pres, plugins, and software. I own lots of vintage gear and I'm already trying to figure out how to unload it. This takes up so much less space and does the same job. Been using UAD for several years now and not looking back anytime soon. Very easy to use. As soon as I plugged in and monitored the sound quality was from a whole different level to what I was used to before this. The plugin bundle it comes with is more than enough to get going without need for any further investment (the interface is a big investment already!). Then there's the preamp modelling which I think is a really great feature. Worth the money if you want to take your studio gear to a serious level. To say something less good I think that UAD should include the thunderbolt cables with any interface purchase. I recently just graduated to the 8p from another interface that will remain nameless and I couldn't be more pleased. It couldn't have been more easy to set up and immediately start using. The auto-sync with Logic (and I'm assuming other DAWs) was a nice surprise. The biggest step up, obviously, is the sound. I A/B-ed my two interfaces with the built-in pres and I was floored by how crystal clear the 8p sounded compared to my old interface. I can't wait to keep exploring and working with this piece of machinery.